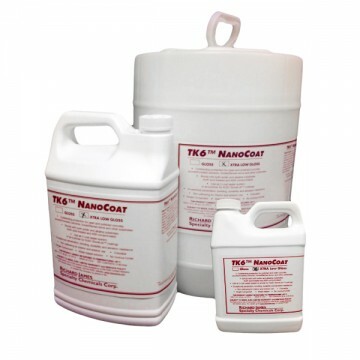 TK6™ NanoCoat is a new single component nano-based copolymer with the scratch resistance and chemical resistance of urethane, but with no mixing. The Green Technology waterborne formula is low odor and with only 95 VOC suitable for even Southern California. TK6™ is great for floors, countertops, brick, stone, pavers, stucco and micro-toppings. TK6™ is water clear, suitable for interior and exterior applications, and available in low gloss or matte finish. Product Description: Easy to use stain resistant coating for concrete counter tops and floors.